StoCretec offer a variety of flooring products from simple screeds to combined screeds and repair mortars. StoCretec Reno F is a system for repairing floor areas and screeding in one product. 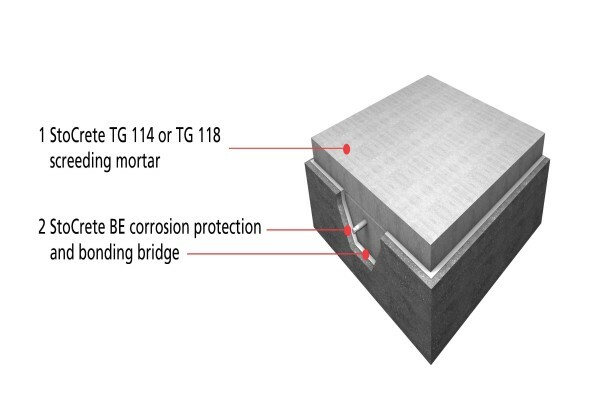 As a class R4 mortar StoCretec TG 114 or TG 118 produce a surface suitable for vehicle traffic such as bridge decks, car park floors, industrial flooring, etc. with low shrinkage and high initial and final strength. StoCretec TG 104 and TG 108 screeds from StoCretec are used to level out unevenness or create a sub-floor for buildings or areas subject to vehicle traffic. StoCretec RM F for simple and quick floor repairs. This 3 in 1 product covers the bonding bridge, filling and screeding functions and is ready to overcoat (typically 4 hours) after application. With superb workability, RM F is the first choice when approaching smaller jobs that need a quick fix but require a professional finish. StoCretec RM F is supplied in a resealable pail so you do not waste entire bags on small repairs.